Card Text Each friendly creature gets +1 armor. Reap: Heal 2 damage from a creature. 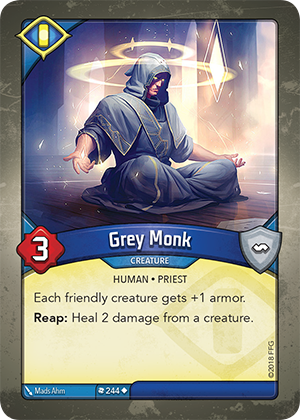 If I reap with Grey Monk and there are no friendly damaged creatures, do I have to choose a damaged enemy creature to heal? No. You are free to choose any creature to heal, even if that creature has no damage tokens.